Here at Direct Pet Supplies Perth we have a great range of supplements to help with your dogs joint or arthritis issues. 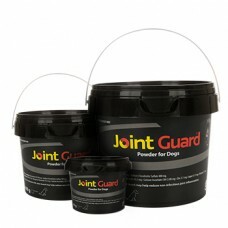 Joint Guard Arthritis Powder For Dogs 200g Each 2.5 grams of JOINT GUARD Powder for dogs contains: Glucosamine Hydrochloride 500 mg Purified Sodium Chondroitin Sulphate 400 mg Also contains MSM, manganese gluconate, calcium ascorbate (Vit C), zinc, copper, vitamin E ACTIONS Joint Guard: provides essential components required for joint cartilage repair and maintenance is for regular daily administration for a protective effect ..
Joint Guard Arthritis Powder For Dogs 400g Each 2.5 grams of JOINT GUARD Powder for dogs contains: Glucosamine Hydrochloride 500 mg Purified Sodium Chondroitin Sulphate 400 mg Also contains MSM, manganese gluconate, calcium ascorbate (Vit C), zinc, copper, vitamin E ACTIONS Joint Guard: provides essential components required for joint cartilage repair and maintenance is for regular daily administration for a protective effect ..
Joint Guard Arthritis Powder For Dogs 750g Each 2.5 grams of JOINT GUARD Powder for dogs contains: Glucosamine Hydrochloride 500 mg Purified Sodium Chondroitin Sulphate 400 mg Also contains MSM, manganese gluconate, calcium ascorbate (Vit C), zinc, copper, vitamin E ACTIONS Joint Guard: provides essential components required for joint cartilage repair and maintenance is for regular daily administration for a protective effect ..
Natural Animal Solutions OsteoForte 60 Caps Joint mobility, inflammation and pain are the most common causes for the changes associated with older dogs and cats. Pain and inflammation is easy to recognise in your pet through changes in behaviour and mobility, but this is not only limited to older pets, it can also occur in younger dogs and cats. Fortunately, Natural Animal Solutions® OsteoForte offers a fast-acting, all natural solution which is free from NSAIDs a..
PAW Osteosupport Dogs 150 Capsules PAW Osteosupport Joint Care Powder for Dogs is clinically proven to provide fast, effective relief from arthritic symptoms. In a recent trial of over 111 dogs and cats, 80% of pet owners saw improved mobility in less than 3 weeks, stating their pets were happier and enjoying a better quality of life. This highly palatable green lipped mussel powder provides advanced care for arthritic pets, formulated in an easy to give measured capsule d..
PAW Osteosupport Dogs 80 Capsules PAW Osteosupport Joint Care Powder for Dogs is clinically proven to provide fast, effective relief from arthritic symptoms. In a recent trial of over 111 dogs and cats, 80% of pet owners saw improved mobility in less than 3 weeks, stating their pets were happier and enjoying a better quality of life. This highly palatable green lipped mussel powder provides advanced care for arthritic pets, formulated in an easy to give measured capsule do..
Rose-Hip Vital Canine 150g Rose-Hip Vital Canine is a 100% natural anti-inflammatory that may be of benefit for improving the joint health and general well-being of active and ageing dogs. The unique property of Rose-Hip Vital Canine is the special patented compound which is activated during the patented drying process, causing it to act as natural anti-inflammatory. Benefits May be of benefit for improving the joint health and general well-being of activ..
Rose-Hip Vital Canine 500g Rose-Hip Vital Canine is a 100% natural anti-inflammatory that may be of benefit for improving the joint health and general well-being of active and ageing dogs. The unique property of Rose-Hip Vital Canine is the special patented compound which is activated during the patented drying process, causing it to act as natural anti-inflammatory. Benefits May be of benefit for improving the joint health and general well-being of activ..
Sasha's Blend for Dogs 250g Sashas Blend™ is now one of the best researched joint health treatments in the world!! The unique all natural Sashas Blend™ formula possesses anti-inflammatory actives which reduces inflammation in a non invasive method with no side effects. It promotes the growth of healthy cartilage and conditions the joints by helping maintain the fluid (known as Synovial Fluid) that cushions joints. The Synovial fluid is important for healthy joint function a..